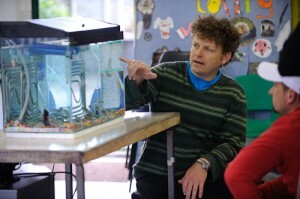 Trout in the Classroom: Ten years old and still going strong! At 10.30am on Wednesday 30 March, pupils from six of our participating Trout in the Classroom schools gathered at Hackbridge to release their carefully and diligently nurtured trout fry into the River Wandle. In fact this has turned out to be the best year ever for survival rates with all the schools having over fifty fish fry at the release stage and some considerably more! Notwithstanding the usual challenges of equipment malfunctions and blocked filters. 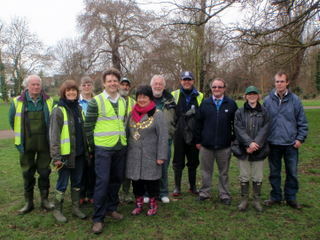 Sutton Council have big plans for the regeneration of the whole of the Hackbridge area as part of the Hackbridge Masterplan, and the Wandle Trust has been working closely with Peter O’Connell and other Council officers to make sure river restoration is also part of this project. 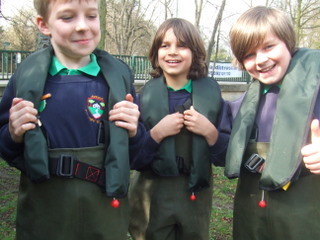 I was particularly aware of how excitedly the children spoke about how it felt to wade in the water. For most of them it was the first time they had ever done experienced anything like this. Like my own memories of a school trip to a waterway I’m sure many of them will remember this for a lifetime! In a rather untimely manner OFSTED chose to visit Benedict School on this very morning which meant the school couldn’t take part in the first release event. 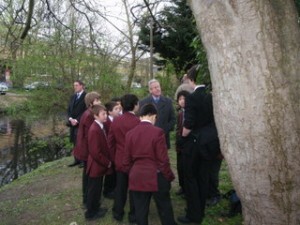 Benedict were very happy though to have their own tailor made release, including a nature walk along the Wandle, the following week on Thursday 7 April. Articles about our Trout in the Classroom trout releases appeared in several local papers. Please click here to read one of these. 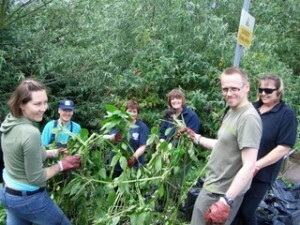 This year the volunteers who helped were: Andrew, Jez, Jim, John, Peter, Sally, Sally-Anne, Susan and Theo. I would also like to extend my thanks to all the volunteers who have supported our schools over the last ten years. Without them this project wouldn’t be possible. 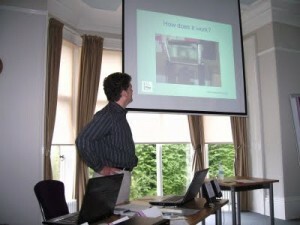 This entry was posted in Uncategorized and tagged Education, Events, Fish, People, Trout in the Classroom, Wandle on May 31, 2011 by Gideon. 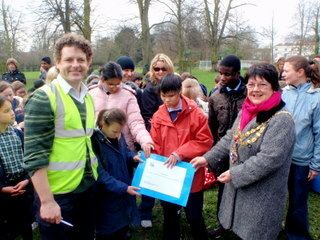 Deputy Mayor of Wandsworth Councillor Jane Cooper presents Linden Lodge School with first prize! Our flagship ecological education project, Trout in the Classroom, has many environmental benefits but we are always looking for new ways of reducing its carbon footprint. 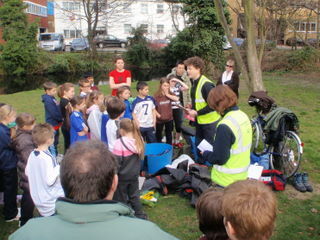 Last year we ran a carbon balancing competition for the schools taking part. 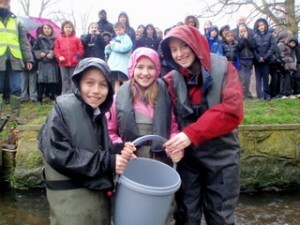 “The brown trout eggs arrived in January and were looked after, as they developed into swim-up fry, for two half terms by Key Stage 3 students. The pupils mostly enjoyed this but their least favourite job was removing the trout faeces or poo as they called it. Use the left over drinking water to water the garden and indoor plants. 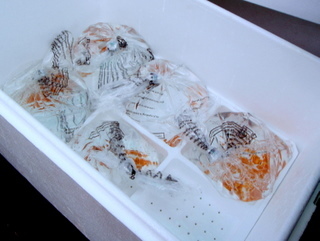 Recycle the old fish water – also very good for plants. All our water saving endeavours won us the Wandle Trust Carbon Footprint Prize. We decided to put the money towards a specially commissioned tactile wall display of the life cycle of the brown trout to help our visually impaired students understand the process”. 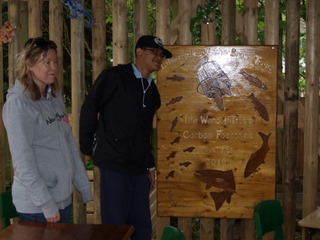 Trout in the Classroom project teacher Launa Randels and a victorious student admire the tactile display. 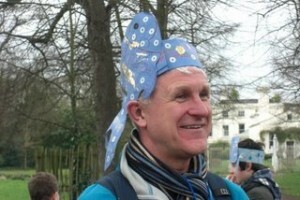 “Linda is really inspirational in the way she gives children tactile awareness and helps them navigate their world. When people visit the school they see children exploring their environment with her tactile references. Much of Linda’s work is unique to Linden Lodge. She uses everyday materials in an imaginative and creative way and her use of colour, shape and texture makes objects come alive which stimulates children to feel, touch and smell. Linden Lodge School provides a high quality educational experience and support for pupils with a visual impairment or multi-disabled visual impairment which affects their access to learning. 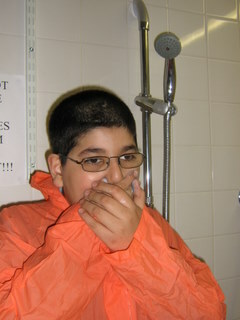 The school also supports pupils with profound and multiple learning difficulties. Linden Lodge has been recognised as a specialist regional resource and caters for children aged 3 to 19. The school is situated in Wimbledon. This entry was posted in Uncategorized and tagged Awards, Education, Events, People, Trout in the Classroom on March 16, 2011 by Gideon. 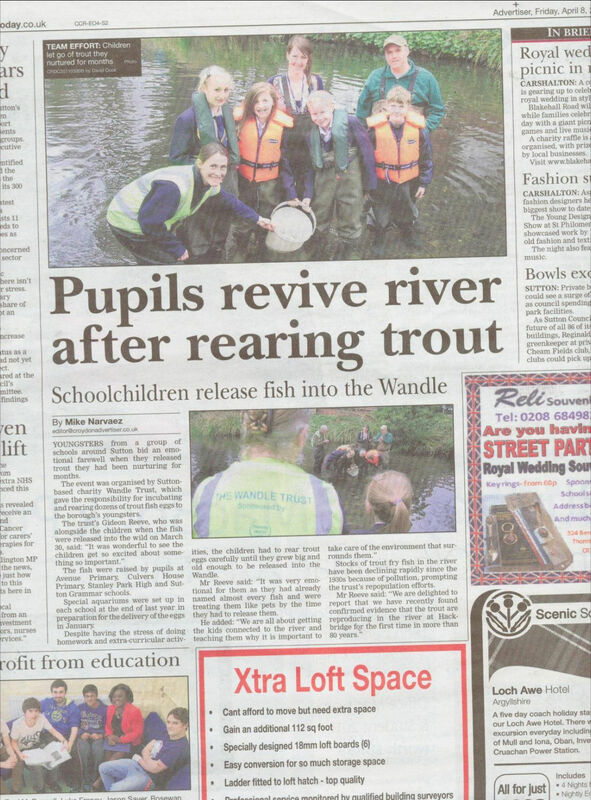 The Wandle makes the news again… and a Happy New Year to all our supporters! 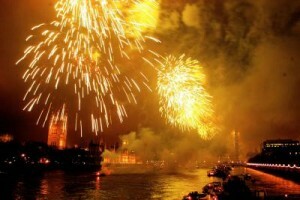 As 2010 slips away into 2011, the Wandle scores a double mention in The Independent‘s end-of-year roundup of river news. 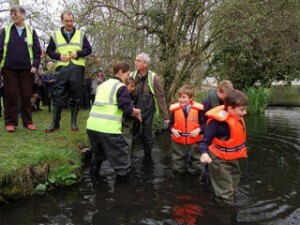 “…the trout are back [in the Wandle], released into the river each year by local schoolchildren who raise the fry under the Wandle Trust’s Trout in the Classroom scheme. 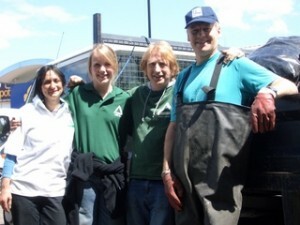 The trust, in partnership with a whole host of organisations ranging from local boroughs to the Environment Agency and fishing clubs, oversees the health of the river and organises regular clean-ups. These, sadly, are necessary because although the Wandle is no longer polluted by dyes and chemicals, it is used a dumping ground for tyres, supermarket trolleys, and any other items of household detritus people can’t be bothered to take to the tip. We may have legislated to prevent industry releasing waste into our waterways but we still have to educate the general public that “river” does not spell “dustbin”. A very Happy New Year to all the Wandle’s supporters… and we look forward to seeing you soon! Update: the debate on the health of water bodies in England and Wales continues here in the Guardian’s Environment Blog. 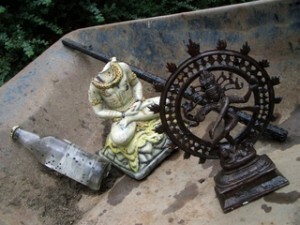 This entry was posted in Uncategorized and tagged Cleanups, Media, River restoration, Trout in the Classroom, Wandle on December 31, 2010 by Theo. 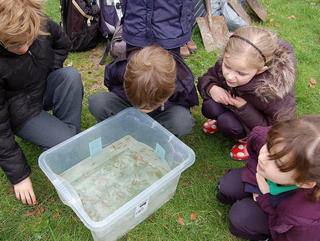 When it comes to environmental education, Avenue Primary School in Sutton is right at the top of the class. 85 per cent of its pupils walk to school, teachers run projects to encourage cycling (and recycling) – and there’s even a kids’ squad of Eco reps who make sure no energy is wasted. Best of all, our regular community cleanup volunteer Abi Johns leads the school’s participation in our annual Trout in the Classroom programme – so it was no surprise that Avenue Primary won ‘Green Primary School of the Year’ at this year’s Sutton Green Guardian Awards! On Thursday 18 March, some of the Eco reps and the winners of the trout competition went to the River Wandle. When we got there the year 6 Eco reps had to put on waterproof waders and a life jacket. We finally got to go into the river with the trout. The water pressure squeezed our legs when we got in. It felt really strange like the water actually going into the waders. 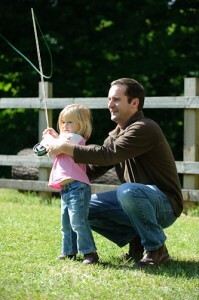 Before we put the trout into the river we had picture taken of us holding the trout. Finally we got to lower the box into the water. The trout were free! Once we had got out and taken the equipment off we went back to school. 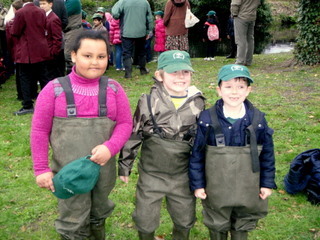 It was great knowing that we had helped the River Wandle’s wild brown trout. You can also click here to watch Abi’s film of Avenue Primary’s trout release. A big gold star for Miss Johns from all of us at the Wandle Trust! 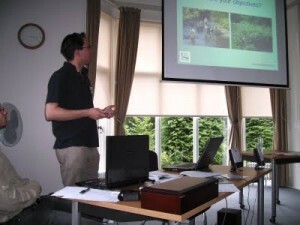 This entry was posted in Uncategorized and tagged Events, Fish, People, Trout in the Classroom, Wandle on July 20, 2010 by Theo. As in previous years our 2010 schools’ trout release days on the Wandle turned out to be exciting and eventful. On Thursday 8 March at 10.30am in the morning we gathered at a new venue for our trout releases – a stretch of the river in front of Sainsbury’s and M&S on Merton High Street. It was great to create such a stir amongst local people going about their usual business. In the afternoon it was off to the Hackbridge in Sutton, a few hundred yards downstream from where earlier generations of Trout in the Classroom have just begun to breed successfully. We were lucky to be blessed with lovely early spring weather throughout the day. The following Thursday 25 March we had a full day on the Wandle at the National Trust’s Morden Hall Park. In the morning it was predominantly Wandsworth schools releasing their fish, and we were delighted to have the Deputy Mayor of Wandsworth as our guest of honour. 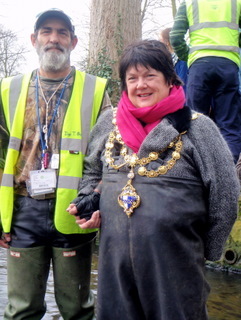 Councillor Jane Cooper was a terrific sport – even getting into the river to help whilst still wearing her mayoral chain to pose for photos. Honeywell School as usual made the most of the opportunity to show real theatricality. 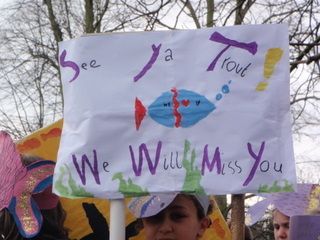 What must the residents of Morden town have thought as the pupils and teachers paraded from the tube station in their fancy dress, sporting banners and carrying their precious bucket of trout fry? This year in addition to the usual class work the project included a Carbon Balancing competition. Participants were invited to work out and then instigate ways in which Trout in the Classroom could reduce the amount of carbon fuels it uses. Winners of the competition were Linden Lodge from Wimbledon who ran a water saving week which highlighted the importance of saving water at home and at school. 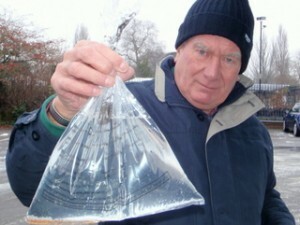 The prize of £250 was very generously donated by Wandle Trust supporter Roger Stevens. The Croydon schools arrived at Morden Hall Park after lunch. No one was put off by the intermittent rain which fell throughout the day. Many of our project partners, friends and volunteers attended throughout these two weeks, as well as representatives from our sponsors including Thames Water and Penta Consulting. 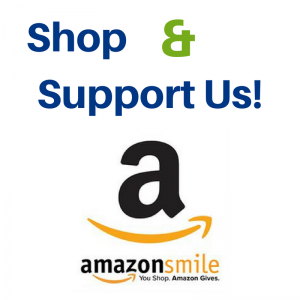 We extend our thanks to them and all our supporters. 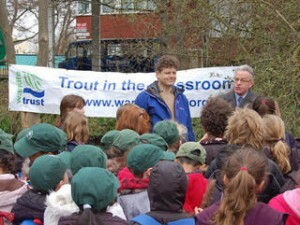 As we gathered at the end of the day we all agreed that it was great to see our local children and young people making a difference to the environment as part of Trout in the Classroom and the Living Wandle project! This entry was posted in Uncategorized and tagged Events, Fish, Trout in the Classroom, Wandle on June 4, 2010 by Gideon. 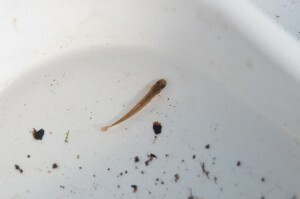 With this year’s Trout in the Classroom schools releases just days away, breaking news from our sister fishing club’s award-winning Anglers’ Riverfly Monitoring Initiative: trout are breeding successfully in the Wandle, and for the very first time one of their tiny fry has been photographed at Hackbridge. 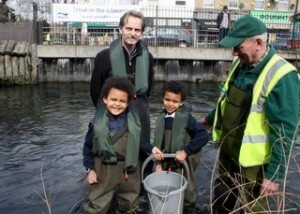 It’s a brilliant vindication of the Wandle Trust’s and Wandle Piscators’ strategy to work with the Environment Agency, the Wild Trout Trust and many other partners to improve adult and juvenile habitat for all fish species on this stretch of the Wandle – and a massive boost for our ongoing mission to improve water quality, clean gravels, and open up fish passage throughout the river. … and keep an eye out for even more opportunities in coming months to get involved in our work with the Environment Agency and the Wild Trout Trust on the upper Wandle: reducing weirs, installing large woody debris, all sorts of hands-on, wet-wellied habitat-creating fun! This entry was posted in Uncategorized and tagged Fish, River restoration, Trout in the Classroom, Wandle on March 15, 2010 by Theo. 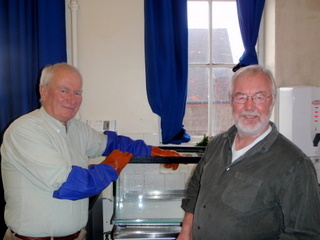 On Thursday 7 January, with all the Trout in the Classroom aquarium hatcheries set up in our 19 schools, and our pupils expectantly waiting for their trouty charges, we encountered two unexpected problems. 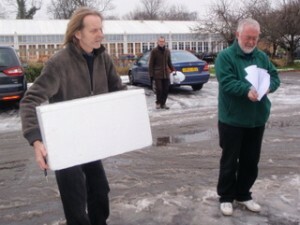 It was egg delivery day – but the eggs, which were beginning to hatch, were snowed in at the Environment Agency’s Sparsholt College in Hampshire. 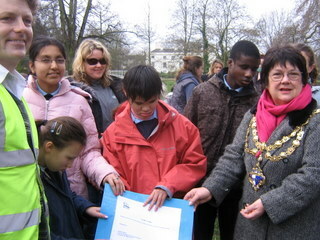 And most of the schools in the Wandle Valley were also closed due to the bad weather. Thankfully, a thaw enabled Roger and me to dash down the A3 on the following Tuesday. We still needed the use of a tractor to get across the snowy fields and down to the hatchery as the access road was blocked. With the help of our hastily reassembled team of volunteers, gathered for the off at Morden Hall Park, we managed to get around all the schools before dusk. Each school received its quota, even though our volunteers now had to deliver watery bags full of newly emerged alevin instead of eggs. This year for the first time we formally recruited a team of volunteers through our own website, environmental jobs websites and our four boroughs’ volunteer bureaus. These 20 dedicated assistants are really enhancing our project this year. 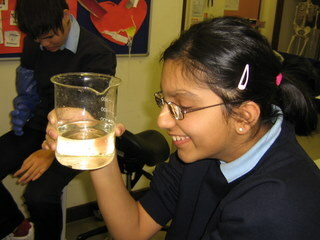 They have been sharing their expertise with the thousands of fascinated pupils. Thanks to all the team: David Alford, John Atkinson, Sue Bailey, Petra Barnby, Kalpna Desai, Chris Dodge, Jane Gardiner, Alasdair Hendry, Andrew Hutchinson, Sara Marshall, John O’Brien, Ben Roth, Marie Sanchez, Roger Stevens, Peter Treagust, Gary Renton, and Carole White. Thanks also to Richard Mundy and the senior boys at Sutton Grammar, Andrew and Dominic, as well as Alan Black at Sparsholt, and Erica Evans here at the Wandle Trust. This entry was posted in Uncategorized and tagged People, Trout in the Classroom, Wandle on January 28, 2010 by Gideon. 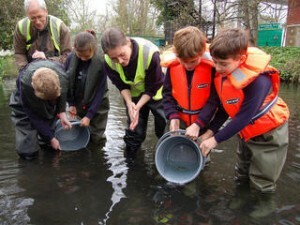 Trout in the Classroom 2009 – 10: calling all volunteers! Once again, the new Trout in the Classroom season is almost upon us, and we’re hoping for an even more successful year than 2008 – 09, when we reached out to more than 9,000 kids of all ages in schools along the Wandle Valley (click here to read our report if you haven’t already seen it). 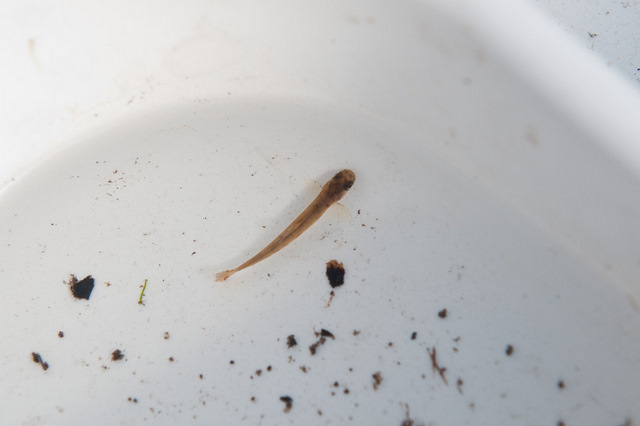 We are looking for around 10 enthusiastic and keen volunteers to assist our Trout in the Classroom Project Manager in setting up 20 trout hatching units and offer ongoing support to the schools until the project ends. You will have a reasonable level of fitness, a practical outlook and be able to work on your own initiative. You will have a friendly, outgoing nature, be willing to learn and have an interest in rivers/wildlife/fish etc. No previous experience is necessary as full training will be given. A full driving licence is essential. We will reimburse travel costs up to a 10 mile radius of the Wandle Valley. Applicants must be prepared to be CRB checked. Interested? If so, please get in touch with us! 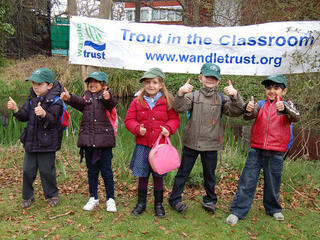 This entry was posted in Uncategorized and tagged Trout in the Classroom, Wandle on October 7, 2009 by Theo. Last weekend Gideon and I took the train up to Sheffield – and the first ever Trout in the Town Urban River Conclave – to bring the Wandle Trust perspective to what promised to be a fascinating weekend organised by the edgy urban arm (or would that be fin?) of the Wild Trout Trust. And fascinating it proved, with many long-awaited meetings of like minds – and faces finally put to blog posts, email addresses, and half-heard rumours of trouty commitment out there in the urban badlands. 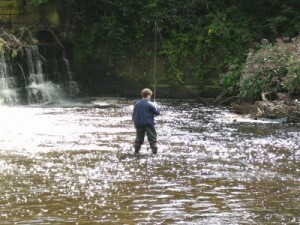 Thanks to our local guides, SPRITE leader John Blewitt and crack caddis expert Stuart Crofts, trout and even grayling were caught on the second day (yes, that’s Gideon fishing the Don below a city-centre weir). At least a couple of our friends have already blogged the event – Paul Gaskell our fearless organiser, and Andy Pritchard of the Lancashire Colne. So we’ll let them do the talking and say no more for now, except… let’s all do it again soon! 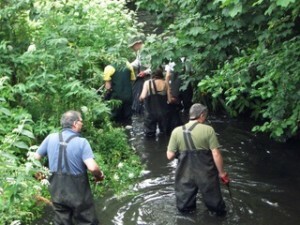 This entry was posted in Uncategorized and tagged Events, River restoration, Trout in the Classroom, Views from the Wandle, Wandle on August 8, 2009 by Theo. We should have seen it coming: the idea of advertising our Wandle Valley Festival community cleanup as part of the Springwatch Dirty Weekend was just too much for the Weather Gods, who took revenge by sending us overnight thunderstorms, and yes, a big Dirty Spate down the mainstem of the Wandle. … we’d luckily already scoped out the little Pickle Ditch where it runs around the ancient site of Merton Priory as an alternative cleanup location. 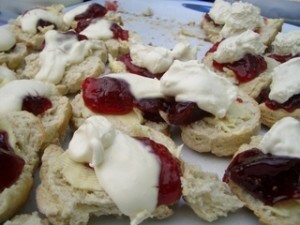 … before heading off to visit other parts of the Wandle Valley Festival. 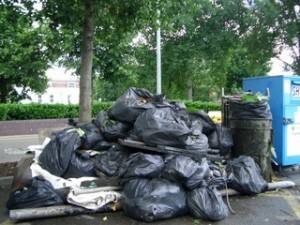 As ever, thanks to Gary and his team from Merton Council for clearing away all the rubbish we collected – and check back soon for more news of our Wandle-wide invasive species eradication programme. 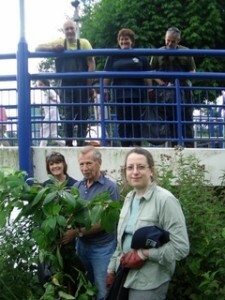 In the meantime, if you do notice any invasive species along the river, including Himalayan balsam, floating pennywort or Japanese knotweed, especially if they’ve appeared where you haven’t seen them before, please let us know by downloading one of these forms, filling it in, and sending it back to us! 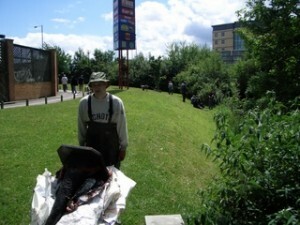 This entry was posted in Uncategorized and tagged Cleanups, Events, Trout in the Classroom, Wandle on June 8, 2009 by Theo.